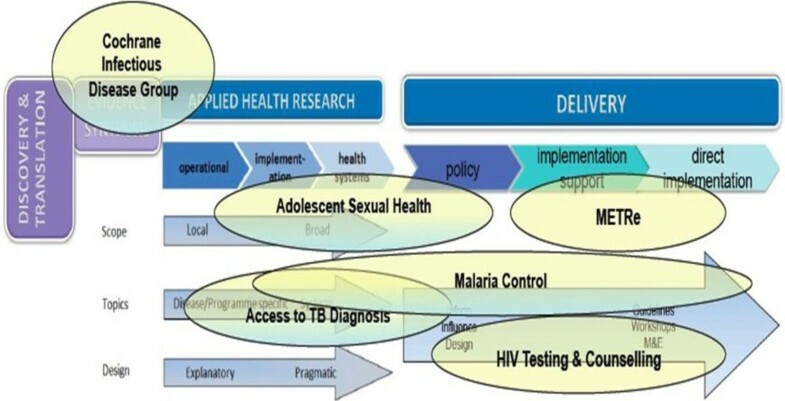 The overarching Aim of the 2014 CAHRD Consultation is to scope likely challenges on the 10 to 20 year horizon for a selected range of health topics: Lung Health (LH), Maternal & Newborn Health (MNH), Neglected Tropical Disease (NTD), and Health Systems (HS) (see Workstreams below), and to plan pathways towards solutions for these challenges. 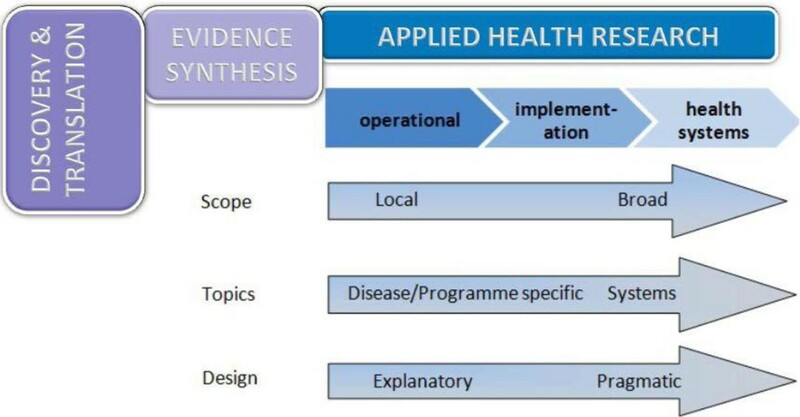 This time scale was chosen in recognition of the fact that research aimed at providing new knowledge to overcome challenges and bottle-necks in health improvement takes time to frame, conduct, analyse, synthesise and use effectively in policy and practice. In addition, some of the selected Workstreams are developing in collaboration with the methodological and disciplinary expertise of the University of Warwick (for examples: Mathematics & Epidemiology, Health Economics, Management Sciences). is based on an area of work to which LSTM and global partners have already made a contribution. includes a summary of the evidence to date – where possible and appropriate includes reference to available systematic reviews. is linked to an emerging international policy agenda or strategy. outlines a strategic approach that the Collaboration is well-placed to take forward. Between February and May 2014, drafts of the 12 discussion papers have been shared for comment and editing across all Workstreams. This has provided an internal and external review process and has promoted dialogue across and between the Workstreams about disciplinary approaches, contexts and health areas. It has also permitted us to begin the identification of some emerging cross-cutting themes and priorities (see Section 7 below). The papers have been circulated to the Consultation participants as part of the ongoing process of facilitating discussion within the meeting. They are not standalone, finalised outputs in their own right, but rather a means of eliciting perspectives from a relevant spectrum of stakeholders as illustrated in Figure 1 and recently advocated by Sheikh et al. They are a starting point for discussion. The overall sequencing of sessions and discussion is illustrated in Figure 2. The first day starts with brief presentations of the discussion papers in plenary with some initial commentary from selected members of the invited external panel. This is followed by in-depth discussion in groups which are reported back through sub-plenaries. By the end of the first day each Workstream will have a draft summary of progress and next steps ready for presentation back to the final plenary session at the end of the following morning. Between those two steps there is the opportunity to reflect and refine ideas in the light of the content of the Leverhulme Lecture in the evening of day one and a Question Time debate which opens day two. The Question Time debate gives the opportunity for people who have not been able to attend the Consultation in person to contribute to the debate by having their questions debated in public by an external panel. Questions have been solicited in advance of the meeting and will be posed to the Question Time panel. The panel has been selected to be a mixture of senior, experienced colleagues debating alongside younger investigators. Not all panellists will be expected to respond to all questions, and supplementary questions can be asked from the floor. The intention is to provide an opportunity for lively and open discussion to shed additional perspectives on the topics of all four Workstreams. Delivery. This encompasses all the activities that develop individual and collective capabilities to implement best practices in health service delivery and multi-sectoral collaboration across a range of health scenarios. It will, inter alia, use evidence generated through Applied Health Research to support public health policy makers and providers in promoting health practices and addressing the delivery needs of poor populations, gender discrimination and health inequities. Delivery is primarily about supporting wide-scale implementation of interventions that have strong evidence of effectiveness and field-readiness (see Figure 4). It includes technical assistance in the form of guidance to meet the specific needs of (e.g.) a Ministry of Health through collaborative communication between a specialist team and the client. 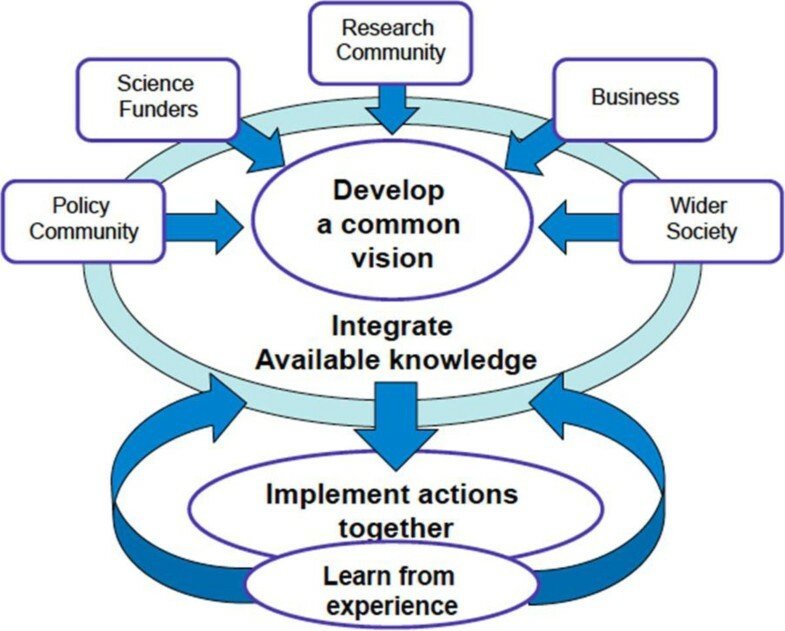 The bi-directional flow of knowledge in relation to Applied Health Research has been represented in a linear fashion (see above). It is recognised, however, that in practice, multiple feedback loops operate in the many cycles of generating innovation, evidence and implementation. It is important to recognise that CAHRD fosters these feedback loops and maintains close and productive linkages with other domains of work, including Discovery and Translational Research. 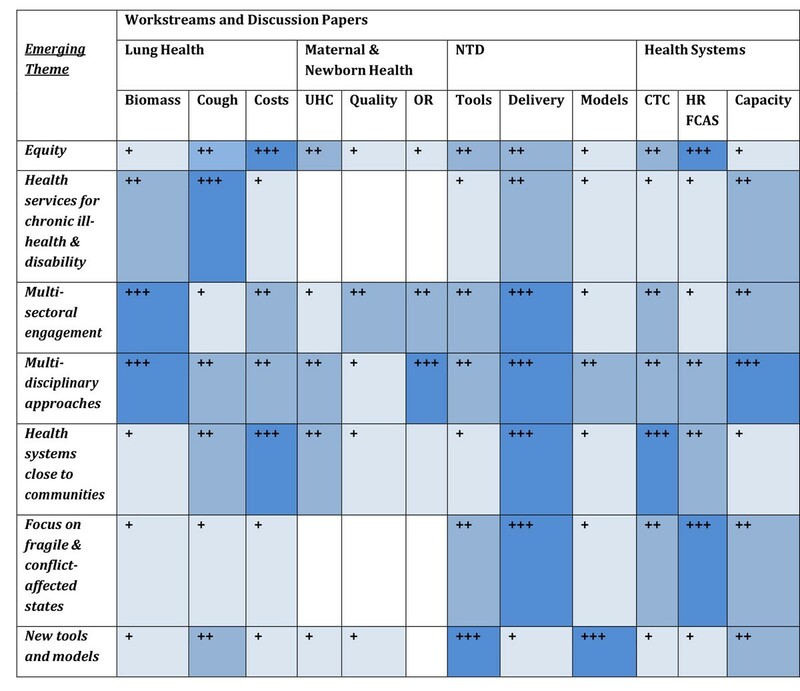 The four Workstreams were selected to represent a diversity of health topics where linkages into broad health systems work are being developed or are ongoing. The vision is that by focussing on these areas as examples, learning points for other areas could also be elicited. Inevitably a number of key areas of on-going work (see below) could not be covered in this first Consultation. There will be opportunities to focus on these in future Consultations. The precise placement of the Workstreams on the spectrum described above is difficult, as many encompass a considerable breadth of activity. Illustrative placements are depicted according to their main “centre of gravity” in Figure 6. Brief descriptions of each Workstream and some reasons for their selection then follow. Surnames of Workstreams leaders are included. 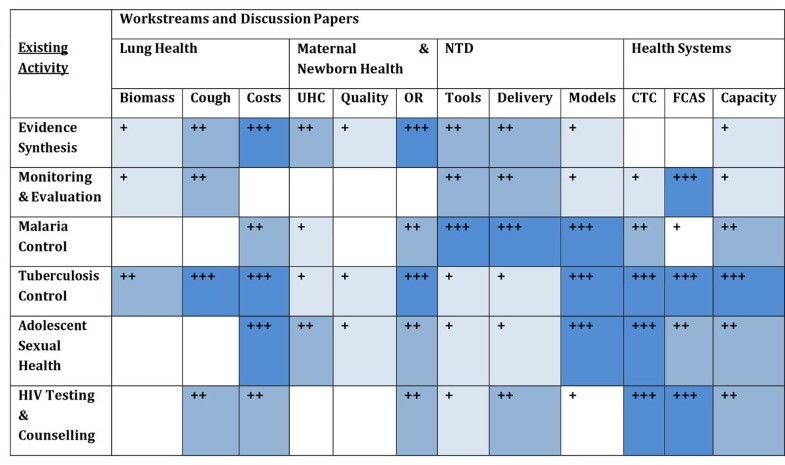 The four Workstreams (Lung Health, Maternal & Newborn Health, Neglected Tropical Diseases, & Health Systems) in relation to the spectrum of Applied Health Research & Delivery. Consensus is building around the need for a greater focus on combating Non-Communicable Diseases (NCDs) such as diabetes, heart disease, chronic obstructive pulmonary disease (COPD) and asthma. These chronic illnesses require life-long clinical and public health management and are projected to contribute an increasing proportion of the global burden of disease in the next 10 to 20 years. LSTM and partners have attracted a number of staff interested in promoting improved prevention and management of chronic airways disease (COPD and asthma) in developing countries. With chronic cough as the commonest presenting symptom of TB, and a common feature of COPD (chronic bronchitis phenotype), asthma and bronchiectasis, there is an increasing need for health services to provide diagnostic and clinical management plans for these patients. These need to work in synergy with multi-sectoral development and evaluation of preventive strategies such as reduction of indoor air pollution and tobacco control. The need to reduce maternal and child mortality and morbidity has been the subject of extensive high level discussion. In part this is driven by clarity that the reductions in mother and child mortality demanded by the Millennium Development Goals (MDGs), even though on track, will not be met by most countries by 2015. Major global health funders have signalled that maternal and child health programmes will remain among their highest priorities. The latest maternal global mortality figures were released in May 2014 and illustrate the need for accelerated action. Within child health, the main focus will be on the newborn with new targets and actions agreed to reduce neonatal deaths and stillbirths. LSTM's Centre for Maternal & Newborn Health manages a large portfolio of work focussed on design, implementation and evaluation of interventions to improve availability and quality of care for mothers and babies in low and middle income countries. Huge gains have been made in the control of NTD's through the use of preventive chemotherapy in mass drug administration (MDA) programmes. These programmes have largely been delivered with a “vertical” approach and with specific diseases targets such as schistosomiasis, lymphatic filariasis and onchocerciasis. With the success of these programmes, some countries now face a future in which disease prevalence will fall and control will rely increasingly on interventions delivered through a more integrated approach within routine health services. Some countries, however, have only just started MDA programmes. These tend to be fragile or conflict affected states and success may not come so easily in these more challenging contexts. In addition there is an increasing recognition that some of the NTDs (e.g. trypanosomiasis) are not amenable to mass drug administration approaches, and will require multi-sectoral engagement including health, agriculture and veterinary services. LSTM has supported the science behind mass drug administration for NTDs over many years. There has also been substantial work at LSTM developing new diagnostics, drugs and insecticides for the control of NTD's. Many of these will be transitioning into field use in the next 10 to 20 years. These need to be evaluated in large scale population based studies in relevant disease endemic country settings. Evaluations will require health economic, logistics, delivery and social science inputs. Formal health systems serving poor populations in the developing world tend to be weak in components of governance, human resources, financing, essential technologies, and health information systems. Human resources are absolutely critical for improvements in health. With severe shortages of formally trained and skilled staff in all of the disease-specific areas described above, there has been a growing experience with the use of close-to-community providers or community health workers. Human resource constraints are particularly limiting in fragile, post-conflict states, where disease burdens are also high. In order to overcome these and other health system constraints, effective approaches to both individual and systems capacity strengthening are required. 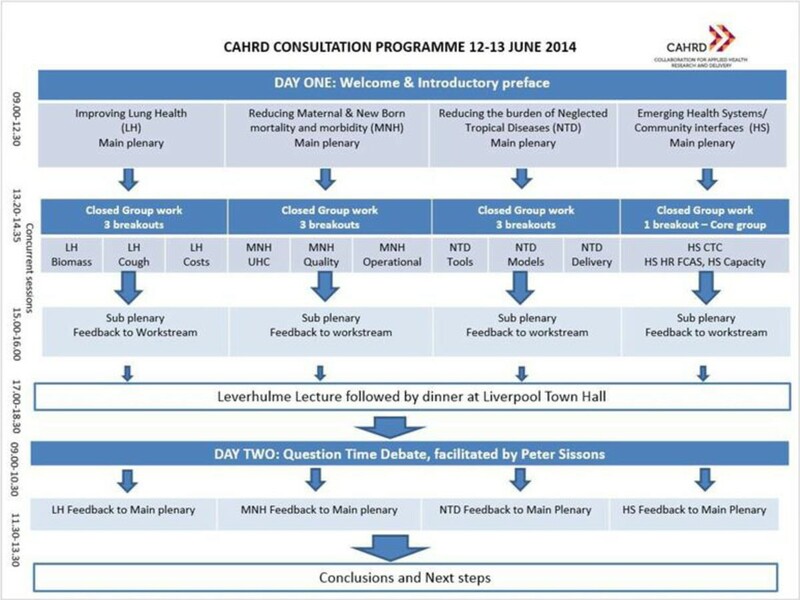 Inevitably, a number of key areas of on-going work could not be covered in the 1.5 days of this first CAHRD Consultation. However, one objective of the Consultation is to identify potential synergies between these activities and the Workstreams, and the intention is to return to these in future Consultations. As in Section 5 above, the precise placement of existing research groups and consortia on the spectrum of Applied Health Research & Delivery is difficult. Illustrative placements are depicted according to their main “centre of gravity” in Figure 7. Brief descriptions of selected areas of work then follow along with surnames of key investigators. Systematic reviews are central to translating research into policy and practice. LSTM has hosted the Cochrane Infectious Disease Group since 1996. The group consists of 17 editors and has published 144 reviews. It has made several contributions to policy development. Selected examples include a global change in the formula for oral rehydration salt; the move from monotherapy to artesunate combination chemotherapy for malaria; debate about the benefits of deworming for child health; and the decentralisation of HIV treatment from hospitals to health centres. An evaluation of the effect of a results-based financing (RBF) intervention in Acholi region, Northern Uganda for DfID. Support to the government of South Sudan to strengthen systems for collecting health data using a mixture of Health Facility Surveys (HFS) community-based Household Surveys (HHS) and strengthening of HMIS data collection procedures. Support to the National Vector Borne Disease Control Program by working in 21 districts in Odisha State, India. The malaria research and delivery activities of LSTM have been aimed at improving control in high risk populations such as infants, young children, HIV-infected people. Both vector control and treatment approaches have been employed. Malaria in pregnancy (MiP) can have devastating consequences in both mother and fetus. The MiP Consortium was initiated with funding from the Bill & Melinda Gates Foundation in 2008 and coordinated by a secretariat based at LSTM. It has provided key contributions to WHO's new global burden of MiP estimates ) and helped WHO and countries achieve a better understanding of the coverage and reasons behind the low uptake of existing interventions by pregnant women of existing interventions. [13–15] Through this work it provided the evidence that led WHO in 2013 to update its policy recommendation for the prevention of MiP, benefiting 39 countries in sub-Saharan Africa. 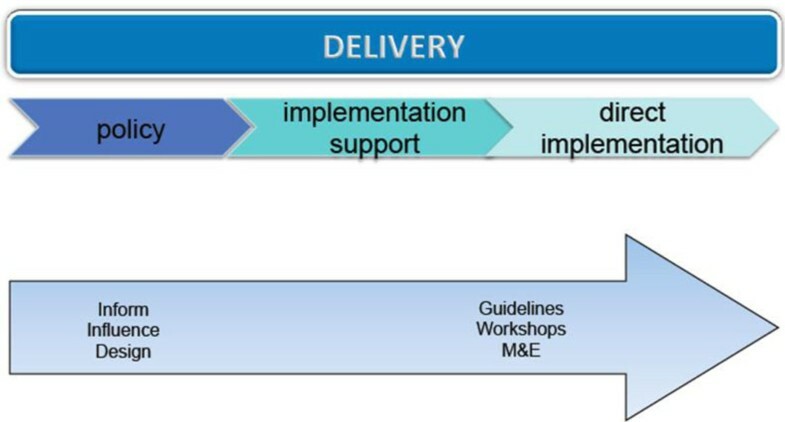 In June 2015 at WHO's Evidence Review Group on MiP the Consortium will present results of 4 multi-country prevention trials potentially leading to further policy change. More recently the emphasis has shifted from research in high risk populations to a focus on reduction of malaria transmission. This will involve applied health research that is closely linked to programme implementation. Tuberculosis is still one of the main causes of adult death in the world. The tools for prevention, diagnosis and treatment are still inadequate and health systems face enormous bottlenecks that hinder its control. LSTM's TB research focuses on generating key evidence to improve the smear-diagnosis of patients attending microscopy centers in resource poor settings, which contributed to several WHO policy changes in recent years including a reduction in the recommended number and collection sequence for collection of sputum specimens. It is acknowledged that one third of the TB cases occurring each year are not reported by National Programmes and that limited access to diagnosis is a key contributor, often with catastrophic economic costs for the patient, the family and the economy. Modelling work developed by LSTM has highlighted that new diagnostics would have limited impact if these tools are not implemented within systems that increase their accessibility to the place of need. [18, 19] We demonstrated that approaches that are closer to the community than stationary health services can dramatically increase access to diagnosis and treatment of disadvantage populations. [20, 21] LSTM work focusing in close to community approaches for TB has been highlighted as a trail-finder by the World Bank and the Global Fund and was presented at the World Health Assembly as means of increasing service access for women. Improving adolescent reproductive health (ARH) in LMIC is key to their development. Pregnancy related death is the single biggest cause of death amongst girls aged 15-19  and rates of sexually transmitted infections (STI) are at their peak among adolescents and young adults. However, the cultural, social and biological drivers of reproductive ill health in this age group are complex. Applied research is critical to understanding and addressing this complexity, as demonstrated by the LSTM-led evaluation of the scale-up of the Mema kwa Vijana (MkV) multicomponent ARH intervention in Tanzania (MkV2). The implementation research in MkV2 highlighted the need and potential strategies for better integration between intervention settings, which is the focus of research led by LSTM through the IntHEC EU-funded consortium and illustrates how Delivery feeds back to Applied Research (Fig 5 above). Outputs from this research range from the first description of the reproductive outcomes and practices of very young adolescent girls (aged 11-15) in Niger, to an evaluation of mobile phone technology as a means of improving the integration of close to community providers in reproductive health service provision in Tanzania. There is increasing evidence for the importance of anti-retroviral therapy in both improving the health of HIV-infected individuals and preventing new infections. With large ‘testing gaps’ remaining in countries with high HIV prevalence, policy makers urgently need evidence on the models and approaches to the scale-up of HIV Testing & Counselling (HTC). LSTM has spearheaded HTC scale-up through combining applied health research with policy influence and partnership with governments and NGOs that deliver these services. It has demonstrated effective quality assurance systems for HTC scale up in Kenya, co-authored a number of WHO documents on quality and developed an international practical manual on home-based HTC. In April 2013 LSTM organized and co-hosted the First International Symposium on the legal, ethical, gender, human rights and public health aspects of HIV self-testing  and is working on a range of studies to address research gaps in this area, including on target product profiles of diagnostics, on couples testing, on the potential for social harms and on the uptake of counselling. All of the above areas of work remain priorities for LSTM and will be carried forward in synergy with the outcomes of the 2014 CAHRD Consultation. Bearing in mind the overall Aim to plan pathways towards solutions for challenges on the 10 to 20 year horizon, the following are initial reflections on progress towards the Objectives. At this stage these are very much in draft form and outlined here to stimulate further discussion, refinement and change in the course of the work on 12th & 13th June. a) Presenting concrete options for the further growth and development of work within the selected Workstreams. i. Work towards better understanding of the health risks associated with Household Air Pollution (HAP), and what level of reduction of HAP is necessary to improve health. ii. Better evidence on which interventions for reducing household air pollution (technologies [e.g. stoves], fuels, ventilation, behaviour) are most effective at reducing HAP. ii. New, better integrated health systems and transmission models for local decision making in policy and practice, along with capacity to develop and use these models. iii. Developing packages of care for the management of disability and promotion of mental health for those who live with chronic disabling and disfiguring consequences of NTD. Equity impact (including poverty status, gender, and intra-household dynamics) on access to healthcare, and the pivotal roles of focusing on human resources for health (in the broadest sense: CTC, capacity strengthening, & approaches to human resource management) in promoting equity in access. The importance of improving the measurement and understanding of costs to patients of healthcare utilization in relation to income. Devising sustainable approaches to health service provision for chronic ill-health and disability will be a major challenge in the 10-20 year horizon. While this need is increasingly articulated for the non-communicable diseases, there is a less recognised need emerging for the management of the chronic effects of all diseases in terms of disability and morbidity such as those associated with the NTD's. the need for multi-sector interventions to tackle the broad determinants of health leads to the observation that there are very few models of effective multi-sector engagement. The need for new and intensive multi-disciplinary approaches in applied health research and delivery, including a focus on capacity strengthening as a critical bottleneck between research and improved health. Delivering sustainable, affordable, healthcare and disease prevention programmes really close to communities. Developing health systems in conflict affected and fragile states and marginalized populations. The need for new tools, applied research methods, locally tailored modelling approaches, technologies and strategies in the areas of diagnostics, treatment, health system functioning, and information systems. These emerging themes resonate to differing extents with the Workstreams and Discussion papers as illustrated in Figure 8. Initial intersections between existing Applied Health Research & Delivery topics and the four Workstreams have been mapped in Figure 9. Evidence Synthesis. Some questions emerging from the discussion papers could benefit from more formal systematic reviews. For example the work on catastrophic costs calls for a systematic review of studies of patients costs incurred during care-seeking for chronic respiratory diseases. Focussed Discussion Workshops. Some of the options are likely to need further work after the Consultation. Individuals working in the Consultation Workstreams and individuals working on existing activities and those interesting in exploring more work on the cross-cutting themes could consider this option. Grant writing panels. Some areas of activity could be matched to existing funding schemes and taken forward in the short term. Publications. Some of the discussion papers could be further developed for publication. Examples include the work of the BREATHE Consortium in putting together a series for the Lancet Respiratory Medicine.